The Models EN-EIC-325 and EN-EIC-325-PCI Four Axis Encoder Interface Cards accommodate most of the popular optical encoders available. The board supports either square-wave or sinusoidal output encoders, both linear and rotary types. It can be directly connected to up to four encoders and will also provide necessary excitation to the encoders. 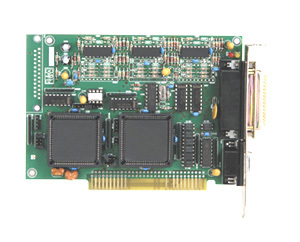 The card is equipped with four differential inputs for limit or home switches/marker/encoder index and 10(PCI)/11(ISA) single-ended inputs for general use. Also, there are four opto-isolated outputs that may be used for set-points, carry/overflow or index/marker and three opto-isolated outputs for general use. The card has four 24-bit up/down latch counters. Each counter can be programmed for a preset value. There is an internal status register for rapid storing and clearing of signals. 참고: Each card is supplied with one mating connector for the 44 pin encoder input port. For an extra mating connector for the encoder input port, order part number EN-EIC-325-CONN, $7. Each card also includes example software and source code illustrating how to communicate with the card under DOS as well as Windows drivers (EN-EIC-325 supports WIN95/98, EN-EIC-325-PCI supports WIN95/98/NT/2000/XP) with complete Visual Basic examples.